sahil yaduvanshi, 4, loves airplanes. He does not have to go far to look at one. He just has to peer out of his playschool window and look up every few minutes to see one. "This is Cattie...," he shouts out to his friend Pushpesh as he looks out. 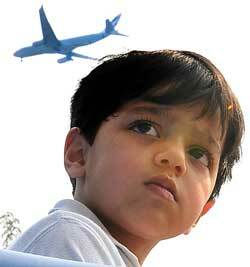 Sahil enjoys the sight of the planes, and wants to become a pilot when he grows up. His only complaint is to do with the roar of the planes. "I cannot hear my teacher and my friends because of the noise," Sahil said. He studies in Aadyant pre-school in Vasant Kunj in Delhi. Most of his friends find it difficult to concentrate after a third runway--Runway 29--became operational at the Indira Gandhi airport in September 2008. "The children get disoriented as there is an airplane flying by every few minutes. We have to repeat lessons and even raise our voices to be heard," said Bhavina Bembi, a school counsellor. The problem of noise disturbance is not restricted to the school but the entire residential area from Andheria Modh, east of the airport, to Bijwasan to its west. These localities are in the airport flight path. "We got the noise levels in Vasant Kunj area checked privately and found it varies between 75 and 100 decibels," said Anil Sood, president of the non-profit Chetna. This is much more than the limit of 55 dB during the day and 45 dB at night set by the Central Pollution Control Board (cpcb) for residential areas. Before the runway was built, the noise level varied from 59-65 dB, according to studies carried out by the cpcb in areas around the airport in 2004 and 2007. Environmental clearances were also given a go by. Sood said he had filed an rti application and found no environment impact assessment was carried out before constructing the third runway. The Delhi International Airport (Private) Ltd (dial), the company that manages the airport, has now agreed to undertake noise abatement measures. This was after a meeting with the Environment Pollution (Prevention and Control) Authority (epca) on January 10 to discuss noise abatement measures. "We are interacting with resident welfare associations of Vasant Kunj and other localities. We will take corrective measures," a dial spokesperson said. dial has promised to install six aircraft noise monitoring systems (anms) by June this year. This conforms with cpcb guidelines for monitoring noise pollution around airports, issued in June 2008. "Right now airports hire contractors to measure noise pollution. They use a simple sound level meter. An anms is a complete set of sound level meters along with software connected to the air traffic control room and measure the noise of each aircraft that lands or takes off," said a cpcb official. He said this would help compare data of aircraft. These instruments cost Rs 50 lakh each and would have to be imported. "Class 1 sound level meters, made as per international specifications, cost about Rs 10 lakh and come with their own software. An anms will have three or four of these devices, said Piyush Kumar a sales engineer with Josts Engineering Company Ltd, an importer. As per the minutes of the epca meeting, the airport managers have proposed closing Runway 29 during the night and switching off one or two engines at the time of landing to lower noise levels. Phasing out old noisy aircraft and using only one runway during off-peak hours have also been proposed. Once that happens Sahil has better chances to work towards his desire to fly. A cpcb official said it is difficult to maintain the noise standards in residential areas near airports at par with other localities. New standards are being worked out, he said. In most countries, noise limits in the airport vicinity vary from 57 dB to 90 dB with a night curfew in many of them. Residents around the airport want a ban on flights at night with immediate effect.